As I’ve continued my search for primary sources for the final project, I stumbled on a gem, in the form of a a series of questions asked by Congressman Jared Polis to DEA administrator Michele Leonhart. During this exchange Polis questions her on health effects marijuana has relative to fellow schedule 1 drugs. After watching this exchange I was in awe. An administrator for the DEA, an organization that has a multi billion dollar war on drugs, cannot factually argue for the policies her organization has created. Her responses reek of uncertainty, and leads me to become scared for our future; that people such as her, hold positions of power that can sway how society operates. Due to time constraints and other obligations, the assignment I originally wanted to complete seemed out of reach. Since this is the first time I’ve had solid access to the Internet since Wednesday afternoon, I’ve decided to use some ingenuity and complete this assignment (albeit late). The assignment I’m tackling is the, context assignment. For this, they ask to use the audio from one movie, and add it to the picture and ambience sounds of another. I thought this could prove successful in portraying how I felt watching the Polis/Leonhart exchange. Since I don’t have the programs necessary to rip a video from youtube and download an mp3 (iPad problems), I’ve located the Benny Hill theme on soundcloud. This is expected to be played over the audio of the interview found on the youtube video. Thus portraying my sentiments of Leonhart coming across as uninformed and making the war on drugs seem like an inevitable joke. The Benny Hill theme does an excellent job, of making something that happened in Congress, come across as a joke. For this assignment I am going to attempt the One Question assignment. I am going to record video on my phone, and edit them on my computer with Final Cut Pro. However with time constraints I’m not sure if I will be able to generate a quality enough video to accomplish the task in a way I see fit. As a backup plan I’m going to also attempt the interview/music assignment. For this I will transfer mp3 files to audacity, and record questions through the microphone input on my computer. When asking such a broad question, the one question assignment can prove successful in framing someone’s insight and mindset at the time and place the video was taken. The openness of the question leaves the responder of the question with free reign to speak of anything that they see as a fit answer. In retrospect these videos could capture the most honest thoughts from these people at that specific time. With the addition of sound and biased statistics, we could make our audience feel a certain way on the topic. When an idea is presented through text alone, we leave the audience to develop their own opinion on the subject regardless of how biased the writing might be. With these additions to the information on the company, the sound and specific numbers generate a sense of fear in the audience. This is also without any preconceived knowledge on the company, we are left feeling this way. I don’t think the producer of the video would have been as successful with providing a dramatic story if this was presented strictly in text. Mapping data will prove essential in visualizing certain raw data we come across. Laying things out visually can prove to give us another perspective on the information. In this example, I’ve highlighted the United States epidemic when it come to incarnation. We are by far leading all of the major powers in the world with the number of people we are imprisoning each year. Our crime rates have fluctuated over the years, but our imprisonment rate has steadily increased. When this data is expressed on a global map, we can comparatively look at the United States and other countries around the world. Text mining will be an essential component in visualizing the answers to the questions Contra will present. Since presedential debate transcripts are so widely available, we can use data mining to specifically find out how many times, The War on Drugs was mentioned by the candidates. This can give us a statistical basis to comparatively look at the funding that was pumped into the war on drugs in the subsequent presedential term. In this current election we see this domestic war scarcely being mentioned if at all by both candidates. I hypothesize that a correlation could emerge showing that the war continues to have an increase in funding, while it being less of a platform for campaigns to run on. Highlighting this information will open up further questions, such as; why? We could also illustrate on whether or not states support an increase, or decrease in budget within this war. This can be done by seeking out secondary sources in which different representatives give their personal opinion on the campaign. 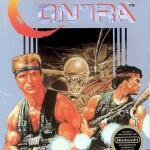 The group name we decided on going with is, Contra. This will coincide with the theme for our project, The War on Drugs. For those unfamiliar with the specifics, this is a 40+ billion dollar a year mission that is funded by US tax dollars, and has been seen as infective at best. Many facets of our governments spending is coming into question, but why has such an expensive and largely inefficient program seemed to have fallen on the back burner of many discussions. TWoD is extremely relevant to our society on a social and international level. Most people in prison are due to drug charges. Drugs affect every aspect of our life, from the legal to illegal. TWoD spans almost a hundred years and touches on conspiracies, economics, racism, and foreign policy. But it likely won’t even be mentioned during the presidential debates unlike the Reagan era, where it was a running platform. Some difficulty may arise in our current method of communication through email. We have created a google doc that will hopefully give us the ability to collaboratively grow an idea from the same digital workspace. We’re undecided on what digital format were going to use for the project, but the recent creation of our google doc should aid greatly into a decision coming shortly. When was the artifact created? Des Moines, IA; at an SDS demonstration at the Iowa capital building. 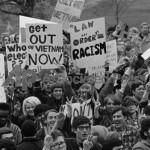 To document the events that were taken place within the college community during the election year of 1968. Why is the document a primary source? This photograph is a primary source because it has never been manipulated (sans AP images watermark) or altered since it was captured in ’68. How trustworthy is the source? Very. The AP images archive is a very credible source for images. What other questions might you ask of the source in order to better understand what it reveals about the events of 1968? In regards to this specific event, I would ask the photographer who he spoke to at the event, and why they decide to attend. I would like to know what the overall vibe and feeling was like within the crowd that day. Also, the difference between demonstrations/protests he had attended that year that took place prior to the election as opposed to post-election. 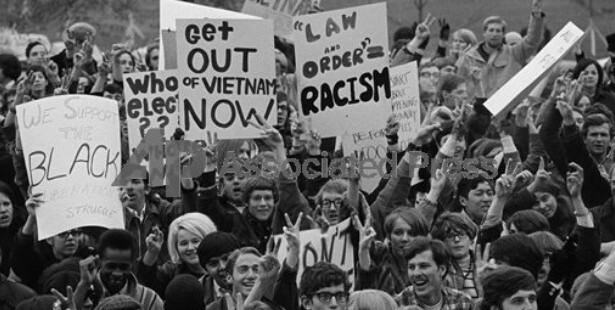 The major themes of the culture conflicts in 1968 are all evident in this photograph. This is a great location and time to help construct an argument about these conflicts. Along with this photograph; in order to present a more balanced view of this event, I would have to see more photographs that were taken at this very event. Ideally it would be best to gather photographs from a variety of sources, that way I can be safe in assuming I’m not getting images that are biased to a specific cause. Along with collecting photographs from the event; written or recorded interviews from demonstration attendees would help with putting a voice to the people in the photographs. It would assist in giving a more through analysis of who was at the demonstration and why. Interviews would be nice, but video of the demonstration would be best. By seeing the event in real time, you will be able to get an unbiased view of the event from a specific vantage point. This would help in making you feel as if you were actual attendee. Any press release from the SDS or varying collegiate organizations in response to the elections, would prove vital in identifying the purpose and message they were trying to give the country with organizing the demonstration. To gather all of these sources I would first attempt to find as many items through the Baruch Library database. Further research can be done at various databases and archives that do not fall under Baruchs database; as well as other libraries in the area. In order to construct a well rounded argument, I would have to read further into the SDS and other demonstrations they held that year. Reading about the specific movements that are mentioned in the signage present in the photograph would also prove helpful in the arguments construction. This photograph was taken shortly after the 1968 elections at a democratic-society sponsored protest in response to the results. The democratic candidate, Hubert Humphrey, was the face for an older generation, And was seen as someone who would not be progressive with his policies. 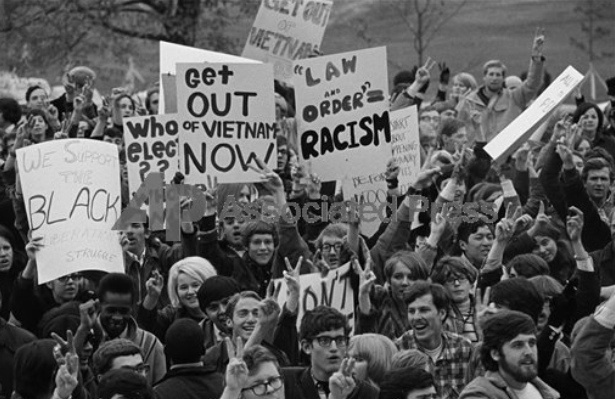 The youth were not content with the progress that the country was making in regards to social and racial equality; as well as the war in Vietnam. With nixon and the republicans gaining control of the country, many of the countries youth were fearful that they may never see the country they all envisioned. This picture personifies the youth movement within the country, and their waning away from the values and beliefs previous generations have had. These elections also dramatized the singluarity within the white and black youth movements. Despite being vehementaly against international intervention, when it comes to matters on home soil, they are beginning to find that intervention and conflicts with police is the only way they can seek desired results. This was the foundation for the youth movement and their political alliances that have held weight till this day. There is a very prominent DIY (do it yourself) approach to this online community. Our society treats education as a “you must”; whereas in reality, it should be an act of free will. It’s an innate ability humans have to want to learn more about the world surrounding them. Due to the stifling neglect of creativity in the school space,young students find the most joy during their playtime with friends. This is because of their ability to create their own space with like minded people. As we get older we simply don’t lose that creative exuberance towards the world. Its a combination of academia and our surrounding world, that expects the rules and procedures to be followed in such a way it deters us from being creative. With communities such as DS106 emerging, and becoming increasingly popular; the idea of ‘taking back’ education begins to come into fruition. The pace at which our society operates, and how effectively we can work remotely, lay the foundation for our future. Massive open online courses that are free and open to the public lay the framework for the taking back of education. In this specific case, the community strives to produce new media through collabration. All collaborating is down on items that can be successfully manipulated and “re-mixed”, under creative commons licensing. The idea of being able to take someone else’s work and adding your own personal touch visualizes the power That fair use can have. Adding your own touch to someone else’s work could prove successful in building on new ideas and being able to gain perspective of the picture from an entirely different viewpoint.